One night around age eight, I was lying in bed thinking of the fun I had had that day with my family. I opened my eyes slowly to see a huge, hairy, manlike monster hovering above me on the ceiling. His appendages stuck to the plaster effortlessly, like a giant spider, and I could see his gigantic teeth waiting to sink into my flesh. I was completely paralyzed. So much that I couldn’t even scream. I lay there on my Care Bear sheets, trapped in my own body, unable to even clench my fists, or turn my head away from the terrifying sight above me. He dropped onto my chest, and I could feel the enormous pressure of his weight. The next thing I knew, it was morning. 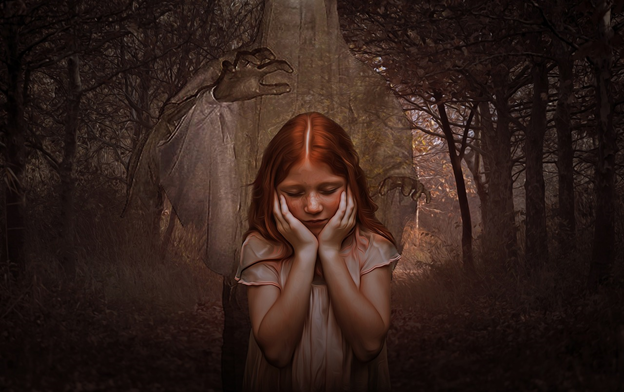 As a child, demons and ghosts weren’t just for Halloween, they were in my life all year round. Sometimes it felt like I was trapped in a horror movie. I could see things that other people couldn’t. The demons didn’t come to visit any of my siblings, I had asked them and they laughed at me for having nightmares like a baby. But to me, they were more than nightmares. I could feel the creatures touch my face, smell their breath, and hear them under my bed and in my closet even during the daylight hours. Would you believe me if I told you these are symptoms of narcolepsy? When people think of narcolepsy, they think of the hilarious media portrayals, like the Argentinian in the movie Moulin Rouge passing out at the most inopportune moments. However, narcolepsy is so much more than sleepiness. It is a chronic neurological condition that impairs the brain’s ability to regulate the sleep-wake cycle. It affects 1 in 2,000 people and only about 25 percent of Americans with narcolepsy have been properly diagnosed. Every person with narcolepsy has a different experience with their symptoms and they are often more subtle and invisible than in media depictions. To everyone who knew me, I appeared to be a happy child. I was a straight-A student and loved to swim, read, and paint. In some ways, I thought of napping as a hobby; I was a professional. I was constantly being shaken awake on the bus, at my desk, on the floor, or in the car. When I was about 13 years old, I finally received my narcolepsy diagnosis after years of doctor’s visits. But nobody told me that these nightmares that felt so real were a symptom of my condition. For years I felt paranoid, afraid of the dark, and terrified of sleeping because I never knew what would be waiting for me in that place between sleep and wakefulness. I believed that the monsters were always watching me, just waiting for me to close my eyes so they could attack. Years later, as a curious teen exploring on the internet, I was shocked to discover that these demons can be explained by some lesser-known symptoms of narcolepsy — sleep paralysis and hallucinations called hypnagogic and hypnopompic hallucinations. When we all dream at night, our bodies are paralyzed so that we don’t act out our dreams. Living with narcolepsy, the boundaries between being awake and asleep are broken down, so I was experiencing aspects of dream sleep while partially conscious, seeing things, hearing things, and feeling touch as if it was real, but I was still trapped in the paralysis of dream sleep. People without narcolepsy can also experience this phenomenon. In fact, about one-third of all people may have similar scary experiences, often during periods of high stress or sleep deprivation. People with narcolepsy may experience these more consistently. My memories of my teenage years must be much darker than the reality. But since I couldn’t separate my nightmares from my real life, they became part of my story. Not trusting my own mind to give me accurate information was something that I tried to deal with on my own. I kept notebooks and wrote down exactly what happened to compare it to what I remembered later. Often I wrote my feelings in notebooks as well, and I wrote about how I felt like a burden to my family because of what they had gone through to reach my diagnosis. I was already seeing a psychiatrist because of feelings of isolation and depression and I was terrified of anyone finding out that I also saw demons. These vivid dreams weren’t always terrible. In fact, I once believed I’d taken a road trip to Mount Rushmore with my grandparents. I remember spending days on end playing cards, cooking on the fire, and watching the fields pass by as we headed west. It turns out, I didn’t go on that trip, and I have never actually been to Mount Rushmore. In high school, I was involved in track and field, weightlifting, marching band, and FFA. Because of my diagnosis, my teachers didn’t say anything when I slept through class. I sat in the back and absorbed the lectures despite being asleep because I never struggled to get good grades. But on the inside, I felt so alone. My outlet was art; painting and drawing made me feel alive and connected to the world around me. One day my pen started to tremble while I was drawing. I felt my fingers loosening on the pen, and everything slowed down like a movie reel. My eyes were glued to my right hand as the pen slowly slid across the page and I realized I couldn’t move that hand, but my arm and shoulder were working fine. I don’t know how long I stared at it in disbelief before I felt sensation returning. It was like the feeling when your hand has been sleeping and you have finally slapped it back to life but it all happened so fast I wasn’t sure what it was. As time went on, I experienced it more, sometimes in my face, my knees, but mostly in my hands. It was just another secret I tucked away about the ways my body could betray me. This symptom of narcolepsy is called cataplexy. Cataplexy is sudden muscle weakness, often triggered by emotions such as laughter, surprise, or anger. The severity and duration vary from person to person. Luckily for me, it is mild. But it is still something that is always with me. Sometimes I go weeks without experiencing it, and other times it’s a daily occurrence. There is currently no cure for narcolepsy. People with narcolepsy may use medication to mitigate symptoms. They may also use lifestyle changes like naps, diet, attention to health, and other support systems. This Halloween, I definitely won’t be heading to any theaters to see the newest horror movie. I have enough creative creatures to deal with on dark lonely nights. Yet now that I am aware of what they are, I can recognize those devious characters in the moment and separate myself from the experience most of the time. Learning to live with these symptoms and accept my limitations is something that I still work on daily. I have tried a variety of medical treatments and alternative options to improve my quality of life with narcolepsy. My key message is that everyone with narcolepsy has a different experience, and what you see in the media is not an accurate portrayal. In many ways, it is an invisible illness that involves a journey of discovery and self-acceptance. Living with narcolepsy has never been easy, but I am proud of where I am today.